What is it about Metro that makes some want to dance? The maker of the film claims he was taking photos of the buses for a project. 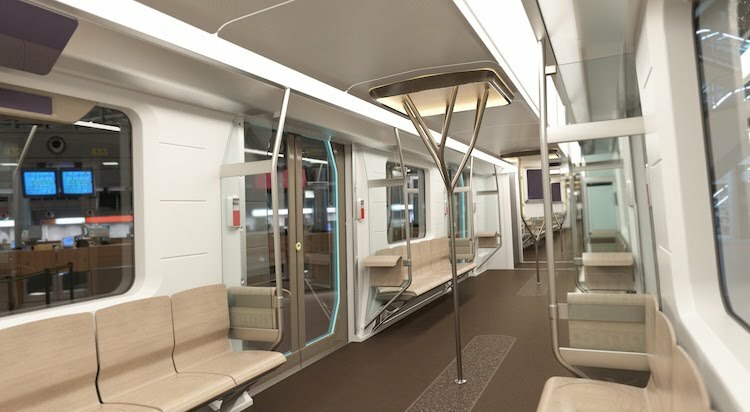 Metro says that staring in January, it will "seek input from its riders and employees during the next 18 months as it designs its next generation of railcars, the 7000 series." In the press release, Metro euphemistically refers to the obsolete 1000-series cars as "vintage." Good one, Metro. Those things shouldn't be carrying livestock. Anyway, as you can see in the above photo, Warsaw, Poland, of all places, is getting some pretty swanky new BMW railcars. Poland, by the way, is not quite as "rich" a country as the U.S.
Metro will NOT be going with the Beemers, but Kawasakis instead. While this pictures has quite the wow factor, one question that immediately comes to mind is where are the people in the center of the car, away from the vertical pole, going to hold on? So here's a chance to let Metro know what you want in the new cars. We also noted some characteristics of the Dulles Airport rail that Metro could investigate. What do or don't you want to see in the new cars? Do you think Metro would really listen anyway? Was it the combined effect of everything I mentioned above? Astonishingly no. When I look back over the 27 months I’ve lived and worked in this area, I can’t believe that for such a long time I repeatedly paid so much for so little. It’s not that I was actually expecting things to get any better…I’m not that foolish. I simply considered it a good day if there were no major delays or inconveniences that made me considerably late for work. Maybe it was out of a sense of helplessness that I kept riding. I had somehow fooled myself into thinking I had no other option. It wasn’t until several weeks ago that I experienced such shockingly rude treatment at the hands of a Metro employee that I realized I didn’t have to put up with this anymore. To recap: Since moving to Baltimore in August, my fiancée and I would drive to the Greenbelt station and take it to Dupont Circle and Farragut North, respectively (before that, she commuted from Baltimore, I from Springfield). A few weeks ago, we attempted to get through the gates at Greenbelt, same as every morning. We attempted to get through one gate and it didn’t work (the lights on this particular turnstile weren’t working to indicate if it was directing people into or out of the station, there was however a piece of paper taped to the turnstile with a green ‘X’ on it … this apparently meant the turnstile was not working). So we both tried a different turnstile. This time the gate opened, but the LED display letting us know if our cards were read properly was not functioning. In any case, the gate opened and we both went through. Here is the interesting part: it turns out that my card was not read properly, but I was not aware of this because the gate didn’t close on me and, again, a malfunctioning LED display did not tell me my card hadn’t been properly scanned. It turns out that this voice was coming from a Metro transit police officer that was accusing me of trying to steal from the Metro by not paying at the gate. This was a shock to me in the first place that I would be confronted by a police officer like this, but to make matters worse, he continued to very loudly and rudely accuse me of trying to get in without paying. I tried to explain to the officer that I had no way of knowing my card hadn’t been read, and also that I wouldn’t have been able to get out at my destination without having to take my card to the station manager at Dupont. This made no difference to this individual. All this time other passengers are filing into the station under the assumption that I was no better than a common thief. I repeated that I didn’t know that my card hadn’t been read, but this officer continued to yell at me, and condescendingly explain how the gates work. We finally walked away, and I took a fairly angry ride to work that day. I of course filed a complaint, and received the standard apology about how this isn’t how Metro employees are supposed to behave and that this person would be reprimanded. He may or may not have actually been reprimanded, but that’s beside the point. The fundamental question is how dare anyone at the Metro speak to a customer in such a shameful manner? Metro employees collectively should be bending over backwards in their attempts to be friendly and courteous for providing such poor service to the public. If I performed my job the way that many at all levels of the Metro system do, I would be fired. That experience and subsequent email was the straw that broke the camel’s back and after looking into the matter, I found a way to still get to work, and not have to pay an arm and a leg for horrible service and treatment. As of Nov. 16, I am Metro free. Now I know that this solution won’t work for everyone. For some people, the (usually) bad experience of using the Metro is unavoidable, and for those unfortunate people, I am truly sorry. But for someone who commutes from outside of the District, there is hope. Yesterday, my fiancée and I drove all the way into the District and parked in a garage close to our office buildings. 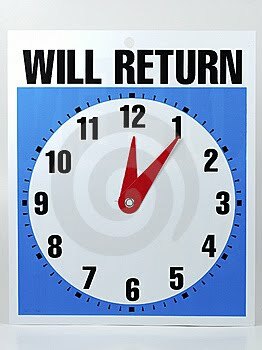 It took us about the same amount of time to be in front of our desks as if we had driven to Greenbelt and taken the Metro in. Here is the real kicker though. 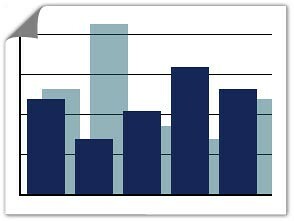 Between the two of us, our combined monthly Metro-associated cost averages out to about $457 per month. To park in a garage that’s right around the corner from her building, and a ten minute walk to mine, we’ll only have to pay a total of $215. That’s right. Less than half of what we pay to use the Metro. 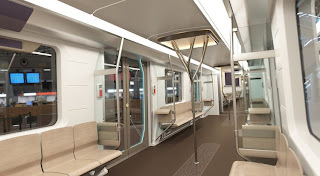 For less than half of the money, we will no longer have to put up with the litany of horrors I mentioned above, and we won’t have to put up with an increasingly rude and agitated public (no doubt made worse by the realization that they are being fully and wholly fleeced by WMATA). 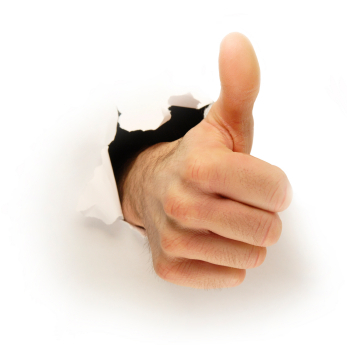 In the real world, a business is rewarded for competently providing or producing goods and services. Just in the same way that I would be fired if my job performance compared to that of all levels of WMATA, most other businesses that provide this level of service would fail. WMATA however can rely on the fact that most people have no other option to get where they need to go. If you are one of those people who truly have no other option than the Metro, I am again truly sorry. But thankfully, I am not one of those people. And I will no longer throw my hard earned money down the never-ending, spiraling pit of despair that is WMATA. Waiting in the rain for the bus, I was ecstatic when it actually came on time. I was taking the L2 north to Chevy Chase Circle and got on at 20th & L Streets around 3:30 pm. I got on the bus and said hello to driver, as I normally do. I was met with a blank stare. I got two steps past the driver, and he peeled off, racing down the street. Because of the rain, the center aisle was wet. And because it was wet and the driver jerked out and race away, I lost my footing. It was a comical fall. My feet flew out, and I landed on my back and on my laptop. The loud THUNK I made shocked the other riders. As another rider helped me up, the bus driver just continued his pace and didn't even look back. Look, I know these things happen, and I'm not the type to complain because of falling because it's wet. However, the bus driver definitely should have asked me if I was alright. I hate that bus drivers race off like that, especially when the bus floors are wet. I see how they wait for the elderly - can't they wait for others as well? Metro really brings out the worst in people, and I found myself I hoping that one day that bus driver falls and the person responsible doesn't even flinch. Ugh. I'm going to go ice my back now. Thanks Metro! 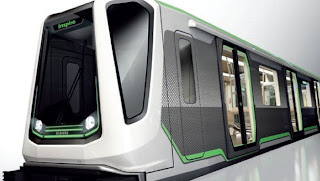 This blog gets dinged for seldom highlighting the positive side of Metro, so here's one. This afternoon, I was planning to meet some friends in Ballston. Even living within a 5-minute walk of the East Falls Church station, just one stop from Ballston, it's usually a no-brainer to drive there instead of taking Metro, especially on the weekends, when trains are about as predictable as the Redskins offense, but today the normally trusty car wouldn't start. I informed my friends I would be late, thinking I'd have to face the ol' weekend Metro nightmare, but by the time I got to the station, the train was a mere 3 minutes out--better most rush hours. 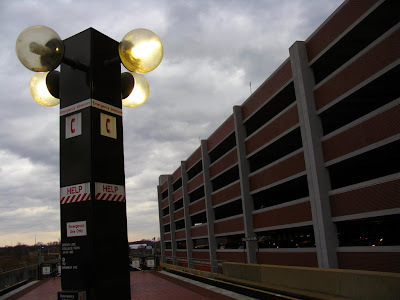 I was in Ballston in about the time it would have taken to drive. Furthermore, I was able to enjoy several adult beverages without even thinking about driving home. That alone is worth a lot. On the way home, I arrived in the Ballston station, and the train was only 6 minutes away. In a relative flash, I was back home, banging out a rare positive post about Metro. The Metro gods are usually a surly lot, but tonight they were smiling on this rider. Well done this time, Metro. You came through in a pinch. I had my iPhone ripped out of my hand while I was on a Branch Ave. train the other night about 9 p.m. It happened in the Columbia Heights station. The person ran at me, grabbed the phone and got off the train before I could follow him. This happens, I understand. My issue is how long it took WMATA to respond. There was nobody staffing the booth. I waited for 10, maybe 15 minutes before someone gave me a phone so I could call Metro Police. By then, this a**hole was probably on the other side of the city. When Metro Police came, about 15 minutes later, the officer asked for a description of the robber. I told him what I remembered -- but it happened in all of 5 seconds. Another rider had seen the incident, and I had their phone number. I offered it to the officer, but he declined. I pointed to the four security camera screens in the booth and said (twice) "Can we look on there because I'm pretty sure [the cameras] caught him?" The officer never directly responded to me about the cameras. I think that by the time they arrived, they knew the chances of catching the robber were slim at best. My issue is not with the how the police handled the situation. It was already too late to do anything. Theft happens. But had the booth be manned, had there been security on the Metro platform or at the station entrance, then perhaps someone could have stopped this thief. And what if I had been injured during this incident? How long would it have taken to get help if I'd been bleeding or something? Rider Peter shares a story about how riders intervened, in the absence of Metro employees, to interrupt an attempted purse snatching yesterday morning at Gallery Place. I was about 20 feet from action, so didn't see the actual snatching, but I did see part of the pursuit. I was coming off the Green Line on the lower platform and saw two people sprinting toward the escalator that goes up to the Glenmont side of the Red Line platform. One started yelling "purse, she stole my purse." The thief ran up the down escalator because the up escalator was already packed. There was a male rider at the top of the escalator who heard the calls and confronted the thief. When I made it to the top, he had the purse and had been joined by one or two others. There didn't seem to be any real fight put up. At that point, the victim was yelling for police, but there didn't happen to be any. There were no WMATA folks in vicinity either, nor did I see any heading to that platform. I think the thief just ran away. I didn't get a good look at her (I think it was woman, not positive). I have no idea if the victim reported the incident to Metro or not. The good news is that riders stepped up and got the purse back; the bad news that the purse snatcher wasn't dealt with by authorities and is still, presumably, out there. Area physicians are noticing an increase in patients reporting symptoms of a never before seen illness they're calling Metroloko. 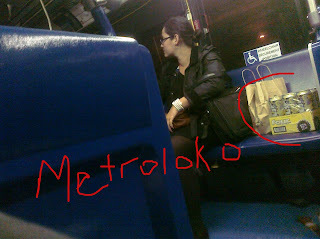 Symptoms that you or a loved one is suffering from Metroloko include anger, frustration, constant tardiness, frequent eye rolling, sweating, shivers, faregate rage, an increased obsession with cars and or bikes, and in severe cases, the inability to board a Metro vehicle without at least a case of 4 Loko. A report released today by the Board of Trade and the Council of Governments calls for dramatic changes to the Washington Metropolitan Area Transit Authority. The Task Force finds that what may have been an appropriate governance structure for WMATA to build a new transit system in the 1960s is not appropriate to operate today’s mature system. 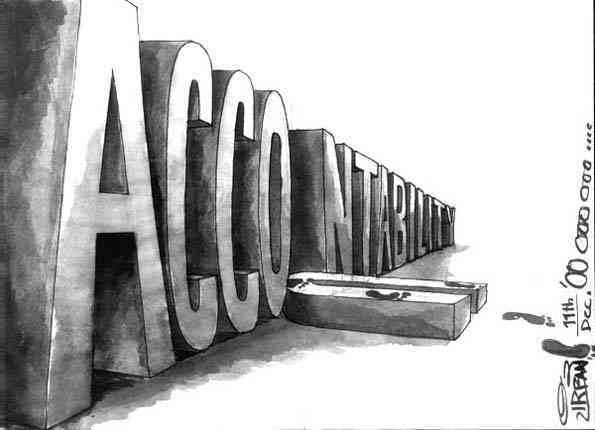 Reading through the report, you're likely to nod your head in agreement quite a bit as it details the lack of accountability, lack of leadership, lack of regional cohesion, a seeming ignorance of the best practices of other transit systems ... the list goes on and on. The report urges the mayor of DC, and the governors of Maryland and Virginia to take "a much stronger role" in selecting the Board members. It all sounds pretty good, but then you get to this sentence, and you wonder if anything will ever really change. In 2038, let's hope we will read a report about marked improvements at Metro, not another indictment of its major shortcomings and inability to change with the times. By far, the most commonly observed sociopathic behavior on Metro is nail clipping. Unsuck saw it again yesterday on the Orange Line in the middle of rush hour. If you've never witnessed it, it's a sight to behold. Usually, there's no attempt to be surreptitious. No eyes darting around the Metro to see who might be watching. No keeping hands low and covering up the clipping sounds with cammo-coughs. No odd contortions. 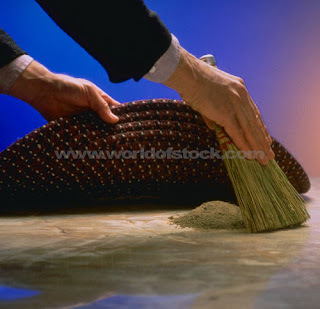 No concealment of the dirty deed at all. The culprits brazenly break out the clippers and hack away, letting the nails fly loose. 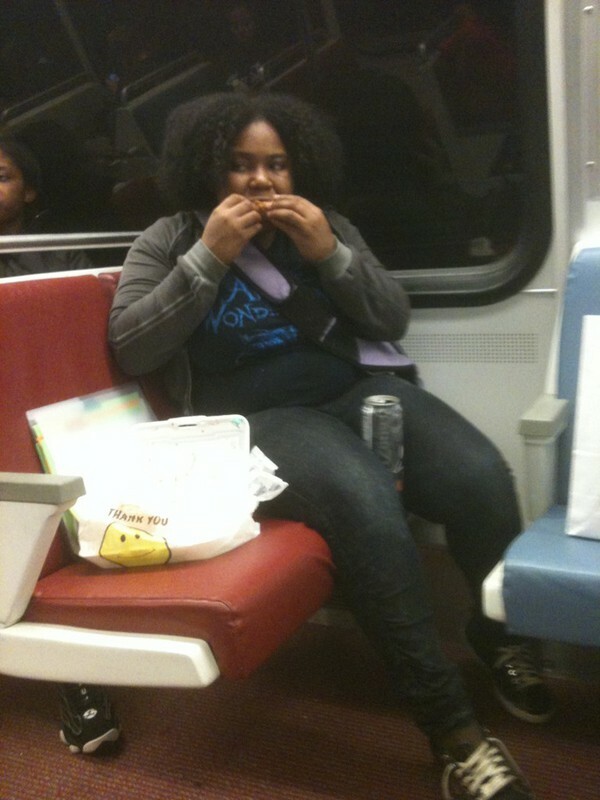 One can sort of wrap the mind around Metro pariahs like seathogs, eater-drinkers, creepy dudes, loudmouths--even arm barber (that hair ain't gonna trim itself) but the subway nail clippers ... It's beyond comprehension and way, way too common. campaign to snuff it out. What do you think could explain such behavior? Photo: mr_t_in_dc. Original pic here. I commute from Stadium Armory to Farragut West every day. The other morning, I got to Stadium Armory just in time to catch the beginning of a circuit malfunction delay on the Vienna/Franconia side of the station, meaning all trains headed west were delayed indefinitely. After waiting approximately 10 minutes, I used the WMATA mobile site to find that the D6 bus would get me to Farragut Park, so I would just need to leave the station, head up the stairs on the Stadium exit side, and catch the bus. I walked up to the south (hospital) entrance, where I had entered, and asked the station manager if she would clear my entry fare on my SmarTrip card because of the massive delay and my desire to instead take MetroBus. She looked at me indignantly, and told me I could just exit normally. I said I did not want to do that as I had not actually ridden the train, and it was, according to the repeated announcements, continuing to be delayed with no clue about when things would clear up. Not only would she not adjust my card, she denied that there was a delay AS THE ANNOUNCEMENT [OF DELAYS] WAS BEING PLAYED over the station speakers. I understand you can’t just come into the station and turn around and expect your money back without riding the train. However, given that there were no trains expected any time soon due to a Metro malfunction and Metro could have easily let me out to catch the D6 bus, I was absolutely incredulous at this station manager’s reaction. Seeking a resolution other than being held hostage for my entry fare, I asked her who her supervisor was, and was told verbatim: “don’t worry about who my supervisor is,” as she shut the door to the booth and resumed ignoring me at her desk. Thanks Metro, for being completely unreasonable and indifferent, and at least feigning an attempt at a positive image with customers. As a fellow Orange Line rider, you may have been part of the "offloading" that took place a Virginia Square the other morning. Offloading is in quotes, because the train started moving again LONG before all the passengers had offloaded. The doors also closed on passengers--including me--during the "doors opening" recording! Would love to hear from anyone who has stayed on an offloaded train on purpose or been stuck on one involuntarily, like these people. What happens? 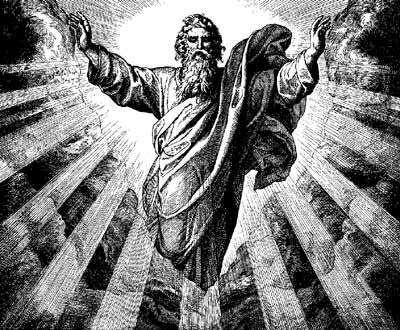 Do you go to Metro heaven or hell? From Metro: "WMATA has found that this [issue] is one of improving communications, not discipline." 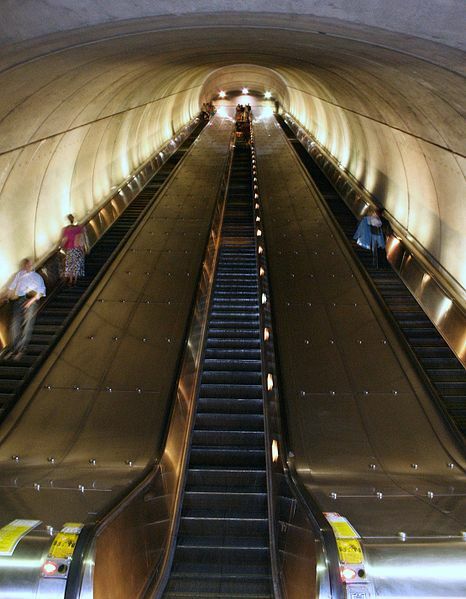 Metro's top management was caught with their pants down Monday over the escalator cover up. It probably would have remained whitewashed had there not been an incident at L'Enfant. VTX's findings, combined with Metro's own inspections, affirm that one of the major factors of the state of Metro's escalators and elevators is a result of many years during which there has been a lack of adherence to Metro's own maintenance standards. Metro will continue its focused work until all 588 of the system's escalators and 275 elevators meet the agency's maintenance standards. The report identifies escalator brake issues among several maintenance issues to be addressed by the agency. Mr. Sarles acknowledged today (Nov. 10) that, while escalator brakes were being addressed as a maintenance issue, greater emphasis should have been placed on brakes as a safety matter and elevated to the Board's attention sooner. But the question remains who will be held accountable for this abject lack of leadership and utter incompetence, both of which again drew blood from the riding public. Metro can't seem to permanently fire texting bus drivers and train operators, McGruff-punching employees, sleeping train operators ... the list goes on and on and on, but what about the bigwigs who hold the lives of millions in their hands? They're not protected by a union. Can Metro fire the management responsible for covering up major escalator problems that led to 18 seconds of terror at L'Enfant? Will the guy in charge of escalators, David Lacosse, stay on in that role? Will the assistant general manager, David Kubicek, who basically lied to the Board of Directors on Oct. 14, keep his job? Back in 2008, Lacosse was suspended for a week because one of the people who worked for him made some off-color jokes at a dinner. “I guess I am the head of the department,” Lacosse told The Examiner. “Ultimately, I’m responsible." What about now, Metro? Seems like this is considerably more serious. Is he responsible? 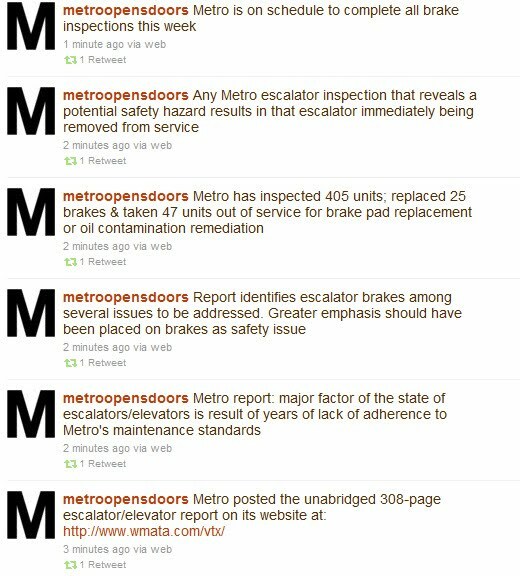 The many injured at L'Enfant, as well as the rest of us who now view all escalators as suspect, deserve to know that someone at Metro is held accountable so that years of neglect won't happen again. A frenzied inspection after the fact, a torrent of tweets and the release of a report aren't enough. 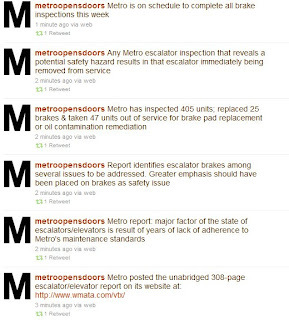 There hasn't even been an apology from anyone at Metro! 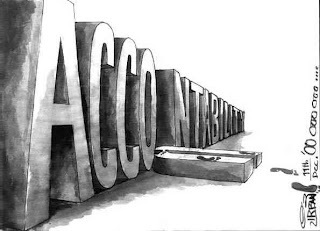 Metro has many problems, and accountability is, in this blog's opinion, the biggest. 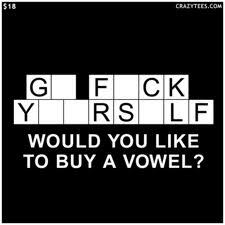 So, here's a chance for you, pro tem GM Sarles, to show that you're not an escalefter blocking progress, that you really meant all those things you said when you took the helm. 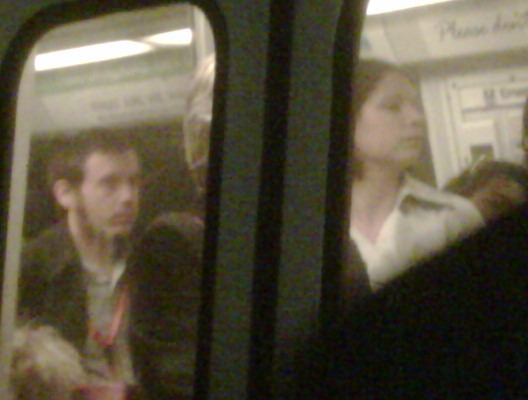 If you have an opinion about what he should do, email Mr. Sarles and let him know your thoughts: rsarles(at)wmata.com. CC Unsuck (unsuckdcmetro(at)yahoo.com). The subjects were observed at the L’Enfant Plaza Metro Station, Orange Line platform videotaping features of the station and operations of the train. Once aboard an Orange Line train to Vienna they videotaped how patrons oriented themselves within the metro rail car. The Metro Transit Police are following up on a report of suspicious behavior reported by a Metro rider last week. As part of the routine follow-up, Transit Police issued a notice to all of its officers to be on the lookout for two individuals who were observed videotaping in Metrorail stations and on trains. The rider observed the men filming portions of the stations and trains, as well as riders at the L’Enfant Plaza Metrorail station platform and on an Orange Line train to Vienna last week. The men, according to the citizen report, were trying to be inconspicuous, holding the cameras at their sides. The rider was able to photograph the men who were videotaping and sent the photo to the Transit Police. Based on the photograph and the information received by the citizen, the Transit Police have no reason to suspect the individuals in question about anything specific. The Metro Transit Police did, however, issue the “be on the lookout for” notice, a standard tactic used by police departments to share information with their officers. The notice advises officers to call the Metro Transit Police Communications or Criminal Investigation divisions if they see the individuals. 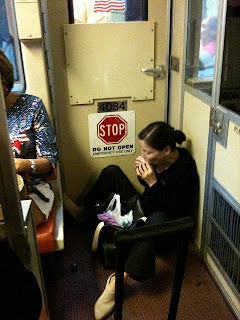 The Transit Police notice was meant for an internal audience only and was not intended to be a public notice. The incident was not meant to be elevated to a public alert level and was not meant to alarm anyone. We applaud our customer’s efforts in bringing this matter to our attention and we encourage all customers to report anything suspicious to the Metro Transit Police Department. Do you bike to Metro? What could be done to improve the experience? If you don't bike, what, if anything, could Metro do to encourage you to? I'd say once every ten days, I see a bike that has had parts stolen. 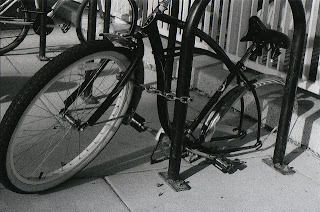 Sometimes, there will just be a broken lock where a bike used to be at the New York Ave./Florida Ave. Metro. 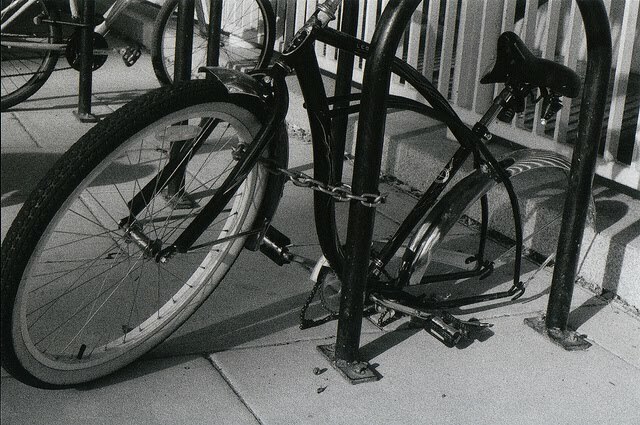 In the above photo, someone had their back wheel stolen. I lock my bike up here every day with two locks. Still, I feel lucky when I see it in place each day. It's even more concerning because the station manager is about 30 feet from the bike racks. Take a look at recent vandalism at the Anacostia station bike lockers. 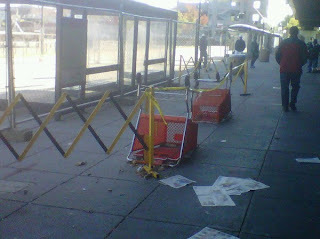 Perhaps Metro should consider selling bike racks inside stations where possible. Nice shopping cart. I wonder where Metro got it? 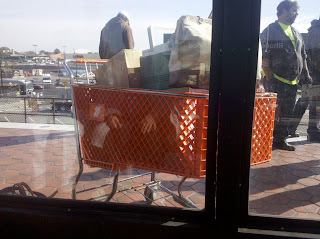 Just because the Home Depot is convenient to the Rhode Island Avenue Metro doesn't mean it's OK to "borrow" their shopping carts. Also, one of those employees was smoking on the platform prior to beginning their work (after 11:30 AM). The most critical thing for rebuilding the dismal state of Metrorail service – not to mention something that ought to prevent people from getting killed, too – is restoring automatic train control in conjunction with introducing a real-time collision-avoidance system. Metro is working on the new system right now. Yet everything is a secret – the agency doesn’t want to say anything about the absolutely critical collision-avoidance system until the whole thing is a done deal, and it’s too late to think about possible improvements or alternatives, or to see what kind of quality Metro put into the effort. It’s an astonishing position to take for an agency that purports to have a commitment to openness and transparency, and which could clearly stand a little scrutiny given its recent record of killing people. 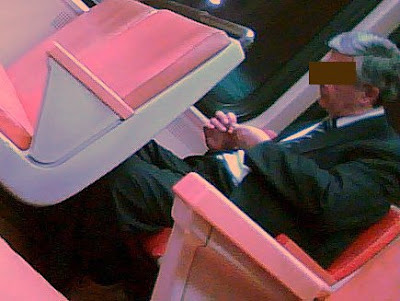 Readers may recall that Unsuck has filed three public record requests with WMATA – on the lowly reliability of railcar doors; on safety and other issues associated with “bellying” 1000-series cars in the middle of trains; and on automatic train control and the collision-avoidance system. We’ve already been haggling for months with Metro about the first two requests. Now, in a response that was 76 days late – the transparency-obsessed agency took nearly nine times the required response period – Metro has finally responded to our third request. The response is a beauty. Metro has declined to release any records about the collision-avoidance system on the grounds that any records that exist are “pre-decisional.” As long as things are in development, nothing will be released. As seasoned Washington hands know, “pre-decisional” has become a weapon of choice for bureaucrats who just don’t want to release anything. It’s true that some precedent allows withholding of records created prior to a final decision on a matter. But since virtually anything can be considered pre-decisional in some way, this exemption has become a leading way for officials to choke off access to just about everything. Officials even routinely stamp records “pre-decisional” even as they create them, just in case someone might ask for them later. So, even though release of collision-avoidance system records might have provided an opportunity for some welcome review by third parties, forget it. Even though Metrorail riders – routinely delayed and nauseated by life under manual control – might have a keen interest in knowing what’s going on with the new system, don’t even think about it. And even though taxpayers who fund the system might be curious what their dollars are paying for, it’s not gonna happen. Thus, a clean sweep: Metro is now three-for-three in deflecting our requests for records in which the public and riders have a clear and compelling interest. So much for that commitment to transparency bunk. There’s always going to be tussling between agencies and the public over access to records. But overall, bureaucrats’ attitude toward transparency is like the possession arrow in basketball – at any given time, it’s pointing a particular way. Some agencies, or administrations, have more enlightened attitudes, and are willing to provide access to most things, with some battling at the margins. Many others have a scorched earth policy, where the imperative is NO, no matter what. Even if they’re wrong legally, they just withhold, withhold, withhold, if only to tie things up for months or years. Metro has now pretty clearly shown which way it has its arrow set. In handling our requests, the agency didn’t have to set up all the barriers it did. WaPo is reporting that people were injured at L'Enfant Saturday on a Metro escalator that suddenly sped up. 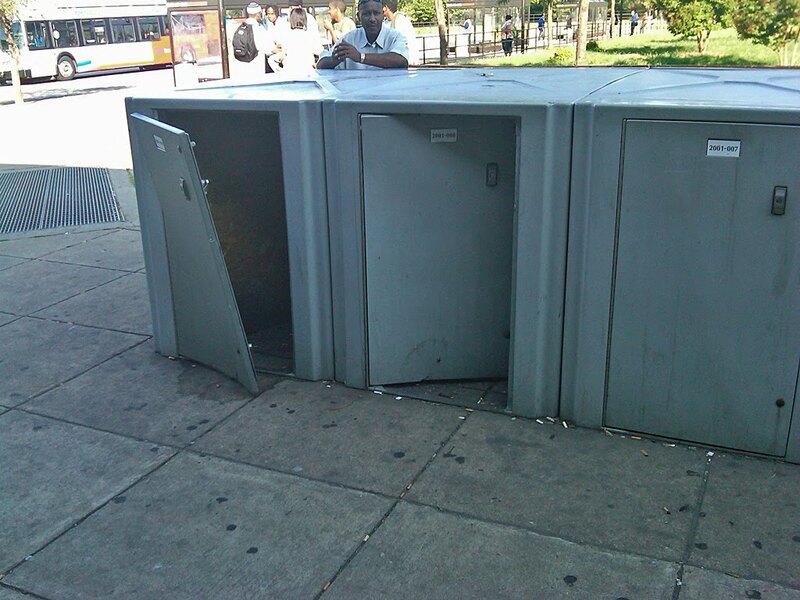 While no one was injured in the story below, it seems much more alarming because of the purposeful actions of a Metro employee who knowingly endangered riders. On the morning of Oct. 26, when I entered the Woodley Park Metro, the long (204') escalators were not working. One broken side escalator was blocked off and the other two were completely stopped. There was some sort of security officer standing at the top with a walkie-talkie, explaining to concerned tourists that yes, the stopped escalators were not working and they would have to walk. I started jogging down the middle escalator. Other people were hiking up both escalators. Suddenly, a genius Metro employee who was standing at the bottom of the escalators --- without any warning --- pressed a button and the stopped escalators started moving. Everyone was thrown off balance, but fortunately, no one fell. Several exiting passengers had made it part way up the middle escalator, which (surprise!) was now going down. WHY wouldn't the Metro employee, as he watched people walk right past him up the middle escalator, remark, "I am about to turn this on; that escalator will be going down, please walk on the left"? What is the role of the security officer if not to warn people that the escalator might start at any moment?